The Vikings knew the Northern Highlands and settled there, leaving place names as just one clue to their culture. This route round the northern rim of Scotland should help you decide if you want to experience the particular ambience of the north. There is an Orkney option as well. Is this the same route as the much-promoted North Coast 500? And you do hear tales of an increase in the kind of visitor who is more interested in the performance of their vehicle than in, say, the scenery or wildlife...so the route has become a bit of a race-track, some say. Anyway, no matter what you read in North Coast 500, I suggest the northlands are covered anticlockwise, as in up the east coast and down the west. Right, as you’re heading north into the old lands of the Vikings, you probably have to make it to Inverness first. Should you stay there? Well, there’s plenty of accommodation choice, that’s for sure. But remember this is no quaint Highland township. It isn’t a huge place but it’s servicing quite a large hinterland, so it’s an important and busy centre. Long ago, a variety of Highland clans used to burn the place down regularly, so there are few historic buildings. In short, Inverness does shops and pubs, theatre and culture, but it doesn’t do quaint. But there’s a lot of quaint to come on this route. Whatever you decide, you have to get yourself via the Kessock Bridge (pictured here - though this pic is looking south, towards Culloden and the edge of Inverness). Then it's across the Beauly Firth and away up the east side of Scotland by way of the coastal margin of Sutherland (which was the ‘south-land’ from the Vikings' viewpoint). ‘Firth’ is also linguistically linked to ‘fjord’, as a kind of sea-inlet. There are a lot of place-name clues on this trip. There’s quite a cluster of old Scottish towns on the way – Dingwall (‘thing-vollr’ - place of assembly or Vikings parliament), as well as Tain, Dornoch and even Cromarty, should you take in the Black Isle, which isn't an island. Cromarty is picturesque, worth a detour, while Tain has the earnest and solemn ‘Tain through Time’ museum display telling the story of this former place of pilgrimage. However, personally, I’d check out Dornoch – photogenic cathedral (pictured here) and nice beach, then re-join the main road at The Mound. On the topic of what to see or not, personally, unless your name is Sutherland and you are doing genealogical research in Scotland, I’d give Dunrobin Castle a miss. The largest house in the north of Scotland is a bit of a hotch-potch of furniture and odds-and-ends - and has been a hospital and a school in its time. There are more authentic castle experiences elsewhere in Scotland. Dunrobin is north of Golspie (with a great fish and chip shop on the main street!) while the town name may be Norse meaning ‘Kol’s settlement or place’, by the way. North again, on through Brora (another Viking name) and on to the village of Helmsdale (Timespan Museum here is an interesting visit with a wee cafe too) – then a real far northern ambience begins to develop. There is a Highland Clearance village site at Badbea, between the main road (signposted) and the steep cliffs, where local folk were forced to settle after the Straths of Langwell, Ousdale and Berriedale were cleared. They later all emigrated. The Sutherland Clearances were orginally carried out in the name of George Granville Leveson-Gower, 1st Duke of Sutherland, sometimes described as the richest man in England in the 19th century. He married Elizabeth Sutherland, 19th Countess of Sutherland, who just happened to have inherited most of the county of Sutherland. The combination of money and land changed this part of Scotland for ever. 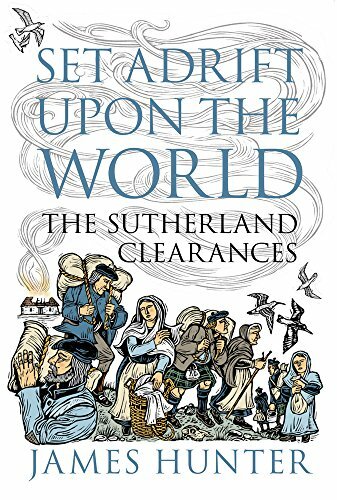 If you want to read the definitive account of the ethnic cleansing carried out as 'improvement' (where the Highlanders were referred to as savages or aborigines) then I can heartily recommend Dr James Hunter's 'Set Adrift Upon the World'. The work is particularly good in bringing out the women's role both in the defence of their homeland and in the new life they built in Canada. Later, the folk who stayed on in this rugged countryside inhabited dwellings of a type you can see at the Laidhay Croft Museum, signposted by the road north of Dunbeath (likewise an interesting wee place). Next take the road across the ‘Flow Country’ – the interlaced lochan and moorland to reach Thurso (Probably Norse, ‘Thor’s river’). This is an overnight stop (if you haven’t stopped sooner!) Alternatively, continue on the coast road through Wick where you’ll find another interesting heritage museum, all about the herring fishery. By now you’ll have cracked the place name code and worked out that Wick is ‘vik’ or Norse for bay, hence Vikings, obviously. I’ll stop this now, unless I spot an interesting place name. I’ve never even mentioned all the ‘-gills’ and the ‘-goes’ and the ‘-sters’ that populate the signposts in the far north. (Pictured here) Looking north to Orkney, across a stretch of bog cotton. Good views of the abandoned island of Stroma from the Gills Bay to South Ronaldsay ferry. It's the dark island stretching left from the house in the picture. Remember to book in advance for this trip. Don't leave it to chance. More to the point, this triangle bounded by Wick-Thurso-Duncansby Head is full of character, big skies, sweeping horizons and romantic views north to Orkney, on the horizon, above. It’s a pity that John o’ Groats is an anti-climax. Although there has been some hotel redevelopment in the last few years with some snazzy Natural Retreat lodges. But do park at the Duncansby Head lighthouse carpark and walk across the rolling heath to see the Stacks of Duncansby. On your way, look out for puffins on the grassy cliffs on your left, facing south. I mean that you are facing south, not the puffins……anyway, plenty more route description below. Keep reading. (Pictured here) The Stacks of Duncansby are an easy walk from the Duncansby Head Lighthouse car park. (You’ll see them almost immediately off to the south.) They are more easily photographed from the clifftop than from sea level as in the picture above. 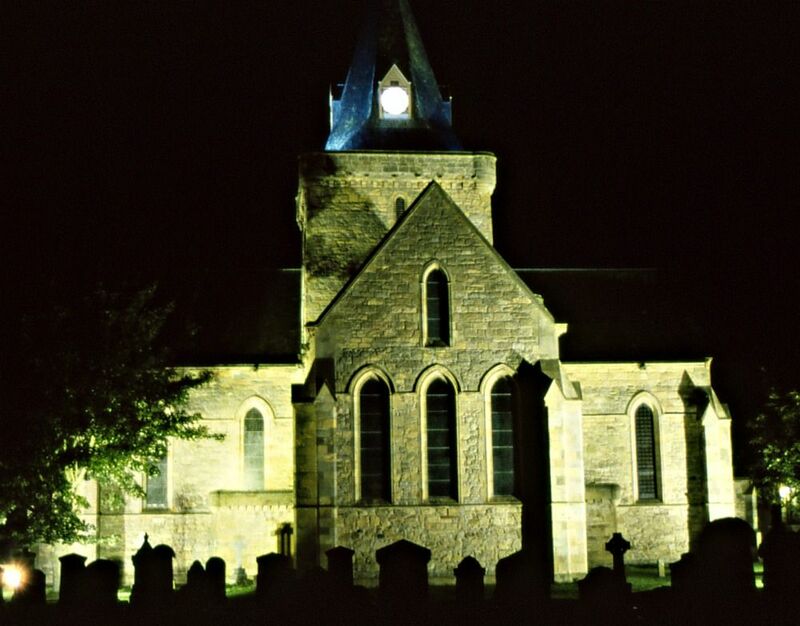 Hop over to Orkney - you'll love it! As you head back to the car park, I hope you’ll have decided to hop over to Orkney. You can go Scrabster to Stromness with (Serco) NorthLink or Gills Bay to St Margaret’s Hope with Pentland Ferries (the link is above) or take the summer only passenger ferry from John o Groats. This would certainly be following the Vikings to their old homelands just across the Firth. The top of Scotland, towards the north-west especially, feels like the empty quarter. The picture here of Strathy Beach, was taken on a fine early September day. The sands were totally deserted. There are small villages, there is accommodation, but it feels further away than it actually is in terms of real miles. Beware - you could get poetic and introspective up here! Coves, beaches, Smoo Cave, the Cape Wrath minibus ride, Handa Island ( the last one a little further on when you reach the western seaboard and turn south again) – yes, there are things to see and it’s rugged and beautiful. After all, you are travelling along the northern rim – the very top of mainland Scotland. Strathnaver Museum in Bettyhill with its Highland Clearance theme adds to this impression of somewhere marginal, and a place of struggle – in short, a sense of the elemental rock and rain, wind and weather and all that other alliterative and poetic stuff. You see? This is what happens if you let the bare, spare old landscape into your soul. You get poetic, introspective and potentially unsociable, I reckon. By way of an antidote, you can be entertained by fireworks in the north-west. Yes, if large amounts of exploding ordnance on the horizon are of interest, then Balnakeil beach, near Durness, is the place to be. There are good views to Garvie Island offshore, which is a NATO bombing range, the largest in Europe. Whoopee-doops. It’s the only place in Europe where, according to some sources, they can drop live 1000lb bombs. But only after four years training, so that’s OK, I suppose. Nearby are Britain’s highest mainland cliffs, west of Durness, across the Kyle of Durness. They bombard those as well. Don’t be put off. The danger zone is well away from the road. It’s not in use all the time and can be quite diverting. And, rather charmingly, they stop for the lambing season. And on Sundays. Further on, turning south near Cape Wrath – from the Vikings’ ‘hvarth’ or turning point – strange hills begin to rear up and it still feels a little, uhmm, other-worldly. In this wet desert – and a desert can be beautiful – the geological foundations are a plinth of Lewisian gneiss – one of the oldest rocks in the world – scoured and hollowed by glaciers, filled with lochs of all sizes. On top of this ancient gneiss, weird sandstone and quartzite monsters crouch. The Vikings knew them as landmarks. Actually, with these old hills, it’s terribly geological round here. On that lonely road south of Durness, you’ll either love every moment of the wildness – or greet the Lochinver pie shop as an oasis. Scrabster to Lochinver is a reasonable day’s journey. Study your map to see the two road loops above and below Lochinver. You don’t have to drive either of these. In fact, please don’t – unless you are patient and good-natured, in case I’m travelling the other way. Both are a picturesque adventure but need care as they are very narrow, with passing places. (Pictured here) We are now well down from the top coast, en route for Ullapool. This view from the main road, north of Ullapool, includes Stac Pollaidh (or Polly), left. Follow that link to find out how NOT to climb it. (Pictured here) Reiff, the end of the road, also near Achiltibuie. The faint wavy marks in the foreground are traces of ‘lazybeds’, the cultivation strips worked by the local folk in olden days, long, long before there was a branch of Walmart in Inverness. If you hurry on southwards by the main road – and there’s still plenty of rugged scenery on the way – you’ll find yourself in Ullapool, quite a well-resourced little town with plenty of wee shops. It bustles in the main season and is also a ferryport for the Outer Hebrides. From there, you’re just over an hour from Inverness, across the bare backbone of Scotland. Ullapool is back amongst the Vikings again: ulfr and boeli, meaning wolf’s farm. Or it’s Ulli’s pool, meaning, well….sometimes I wonder if these guidebook writers don’t just make up the etymologies as they go along. Ullapool, a main centre in the North-West Highlands and ferry port for the Isle of Lewis. Is all of this northern section worth seeing in a week? Definitely. Personally, if time was tight, I would still try to make Orkney and just hurtle round the north-west mainland. Sorry about the bombing range though at the very top of Scotland. Presumably it’s the same logic that chose the north coast of Scotland for Britain’s first nuclear reactor in the 1950s. Best to keep such things tucked out of sight, eh? Or at least, well away from Westminster, England. Anyway, I feel I hurried you along the last bit, when, assuming decent weather, it’s the sort of area you ought to walk out into, touch the rock, smell the bog myrtle, hear the wailing call of the black-throated diver and curse those damned midges again. Links below to more on Orkney, the old island homeland of the Vikings. Or, there may be some stuff you need to know about midges in Scotland if you are thinking about a trip to the north and west of Highland Scotland. And see our accommodation page for a few suggestions if you are taking this northern route. A check-list for the Highland Capital. Discover what to see in 48 hours plus explore Loch Ness too (if you really, really feel you should). This is a tried and tested itinerary that will work for you. You'll find that Inverness is a bustling small city with lots to see but not much that's 'quaint'. Scottish Highlands accommodation isn’t all log fires and lolling Labradors. There's a huge variety of hotels. But the log fire is still an attraction! Midges in Scotland - protect yourself from a Highland menace! Essential advice on where and how to avoid midges in Scotland. Will they spoil your enjoyment of the Scottish Highlands? Yes, they can be a serious nuisance - though you’d have to be bitten by 20 million midges simultaneously for their bites to be fatal!